3D bioprinting deposits materials called Bioinks layer by layer, producing tissue-like structures. Using this process, bioengineers have created human parts such as an artificial ear that looks and functions like a natural ear. The development could help, for example, many children born with a congenital deformity called microtia. 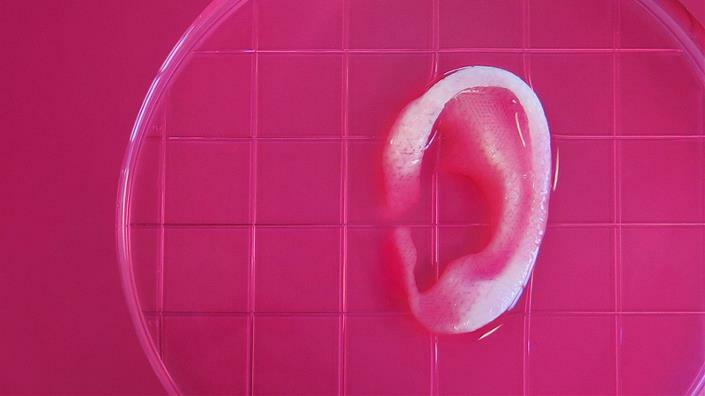 “Assuming we will overcome the efficacy concerns, we expect the first child to have his or her hearing restored by having one of these printed ears implanted,” said Sadeghi. Dassault Systemes is not the only company working with biomaterials. The Wake Forest Institute for Regenerative Medicine in North Carolina, for instance, prints human cells in hydrogel-based scaffolds. San Diego-based Organovo, meanwhile, prints organs directly assembling 3D tissues without using a scaffold. In 2010, the firm bioprinted working blood vessels, made from the cells of a person. Earlier this year, researchers at the University of Gothenburg used stem cells to 3D print cartilage tissue. Not only the stem cells survived, but they also multiplied and formed chondrocytes (cartilage cells) in the printed structure. “In nature, the differentiation of stem cells into cartilage is a simple process, but it’s much more complicated to accomplish in a test tube,” said Stina Simonsson, a biologist who led the study. 3D bioprinting research is happening in parallel with what is known as ‘organ on a chip’. Scientists build integrated circuits lined with living human cells on a microchip, to replicate an organ – and if successful, the research could revolutionise drug discovery.